I always find the first week of January a bit of a whirlwind, getting back into routines and waking up early again. I spent half my time exhausted and the other half asleep! I figured that really this week would be a better fresh start for me, and so that's what it's been. I've started working towards my goals for this year, and I'm so excited to see what the rest of January will bring. We're not even two whole weeks into 2018 and I've already finished three books! 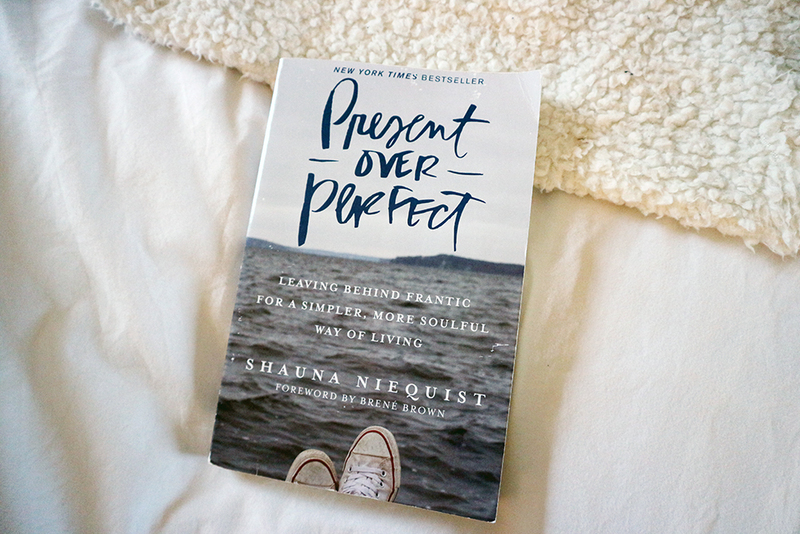 The one I've been reading this week is Present over Perfect by Shauna Niequist. I have wanted to read this book for so, so long, and I didn't love it as much as I thought I would (it's very religious, which isn't something I really relate to) - it will join Big Magic by Elizabeth Gilbert (the first book I read this year) in my category of books that I thought would change my life but didn't. Whilst I say that, I did really enjoy reading it, and I have taken away the main message of the book so hopefully I can use what I've learnt to make positive changes in my life. I've just started The Power by Naomi Alderman, so I'll report back with my thoughts next week! On Monday Zach had his first swimming lesson without me in the pool, so for the first time instead of swimming with him I was stood at the side watching. I can't even begin to tell you how anxious I was in the run up to the lesson. My little boy would be in water, without me, swimming and hopefully following instructions?! It just didn't seem possible. But, as being a mother has continually shown me, my fears are usually wrong, and Zach had an absolute blast in the pool. After having a little cry (seriously emotional mama over here!) I calmed myself down, and found myself really enjoying watching my fiercely independent boy starting the next stage of childhood. He starts preschool on Monday, something which I was also reaaaaally anxious about, but after seeing him enjoy swimming so much I think he will love preschool just as much! This week I made a change to my diet as I joined Slimming World for a second time. It has been almost a year since I started my "weightloss journey" for want of a better phrase, and to be totally honest I'm almost back to where I started after falling off the wagon quite dramatically in the autumn. I'm eager to get back into the swing of healthy eating, and hopefully this time I can make it more of a lifestyle change! The one thing I have been permanently wearing whilst at home has been my new slippers that I bought in the Fat Face sale. I actually ordered them on Christmas day, but they didn't arrive until late last week, and since getting them I honestly can't get enough of them. I don't know how I've survived the colder weather without a pair until now! I'm planning to buy another pair of slippers for my office too - nothing will come between me and warm cosy feet! The funniest thing I've heard this week was when I walked into the living room to find Zach talking to a stranger on my phone! I had received a call, and he had answered it, put it on loud speaker, and was having a proper conversation with the person on the other end - something which he rarely does with anyone. I actually just let him chat for a little bit just so that I could hear what he had to say as I couldn't believe what he was doing - so funny! I'm making it my mission to start going to bed earlier so that I can wake up earlier. I am notoriously a night owl, but recently I've just been finding myself exhausted so I want to shake up my routine. If anyone has successfully turned themselves into a morning person please give me your top tips. I'm not sure if it's something I can actually change, but I'm going to give it my best shot! I loved The Power, it's so thought provoking and really drew me in. One is the amount of space you have available for your pool and the other is the type of swimming pool your are going to have installed.